Rockstar Games didn't give us a lot in the Red Dead Redemption 2 trailer, so we started guessing. Earlier today, Rockstar released the first official trailer for Red Dead Redemption 2, fulfilling the promise it made back when it first announced that its beloved Red Dead franchise was getting a new entry. 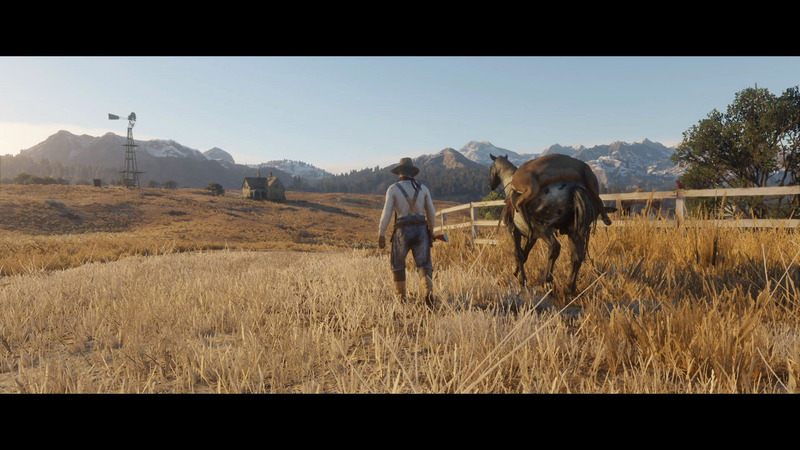 The trailer, while certainly eye-catching thanks to its grand, sweeping shots of the plains and forests of the Wild West, didn’t elaborate too much on the game’s story, nor did it feature any direct gameplay despite the fact that the entire trailer was shot using in-game footage. 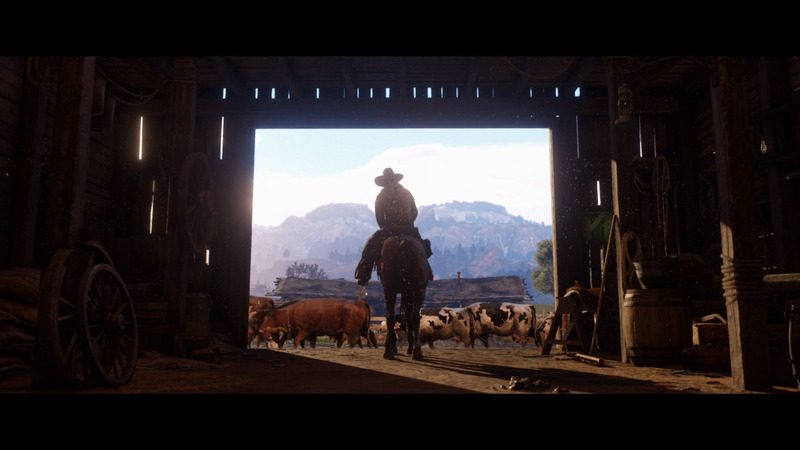 However, there was plenty about the trailer which Rockstar didn’t draw direct attention to yet which could have a great amount of significance in the final game. We’ve broken down the hidden details we noticed in the trailer and offered some speculation on what they could mean when Red Dead Redemption 2 launches next year. For your convenience, we’ve provided an embedded version of the trailer as well as time stamps for the details we discuss so you can jump right to them if you want to follow along in real-time. 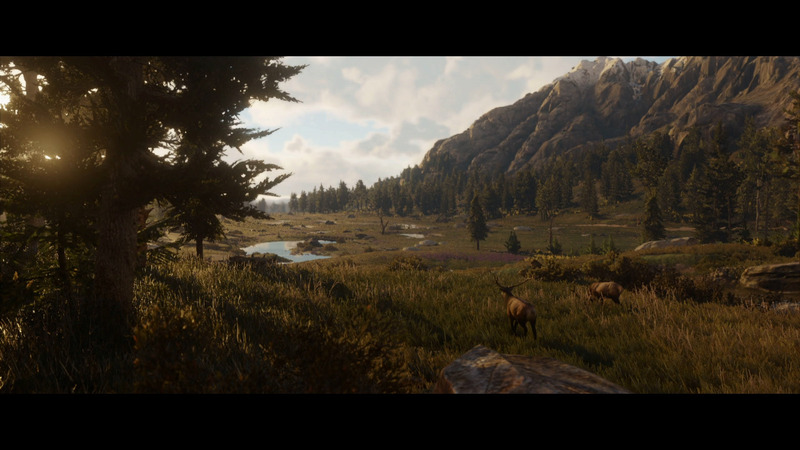 Fans of the original Red Dead Redemption will remember that hunting wild animals like rabbits, deer, and even predatory beasts like wolves and bears was a pretty big part of the game, and the presence of deer in this shot confirms that wild animals (and thus hunting) will be a part of Red Dead Redemption 2 as well. Wouldn't it be amazing if you could customize your farm? This morbid reminder of just how harsh the Wild West can be also serves to show just much attention to detail Rockstar has put into Red Dead Redemption 2’s world. It could also be hinting at a possible gameplay feature through which players could customize the layout and aesthetic details of their own farm, either in the story campaign or online multiplayer. With scenery like this, we're prepared to beg Rockstar for a PC version. 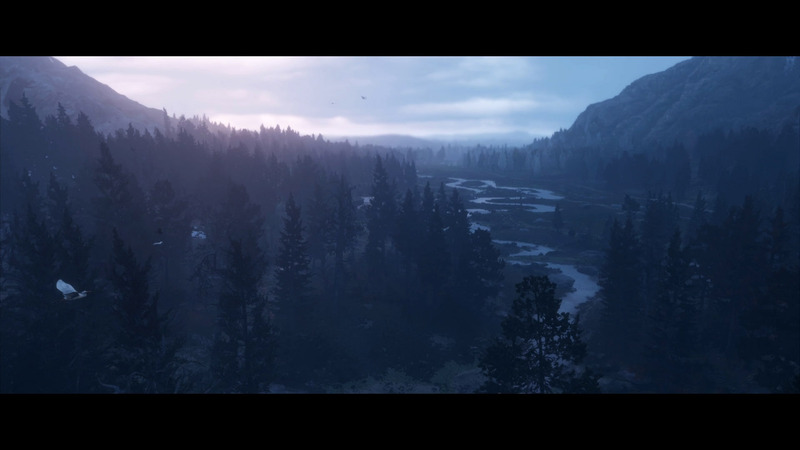 Not only is this one of the most beautiful shots in the entire trailer, it also shows that, again much like its predecessor, Red Dead Redemption 2 will apparently have a full day/night cycle and different types of weather. This isn’t a terribly surprising detail considering how groundbreaking the original Red Dead Redemption was in terms of portraying weather and day/night gameplay, but it’s nice to see that Rockstar is looking to clear the high bar the original game set. Do you think we'll be able to set up our own camps in this open world? Now here’s the first really interesting detail casual viewers might have missed. Sure, it’s nice to see that players will apparently be able to once again set up their own camps (or at least utilize the camps made by NPC characters), but if you look up, you’ll see a mesmerizing constellation of stars in the night sky. 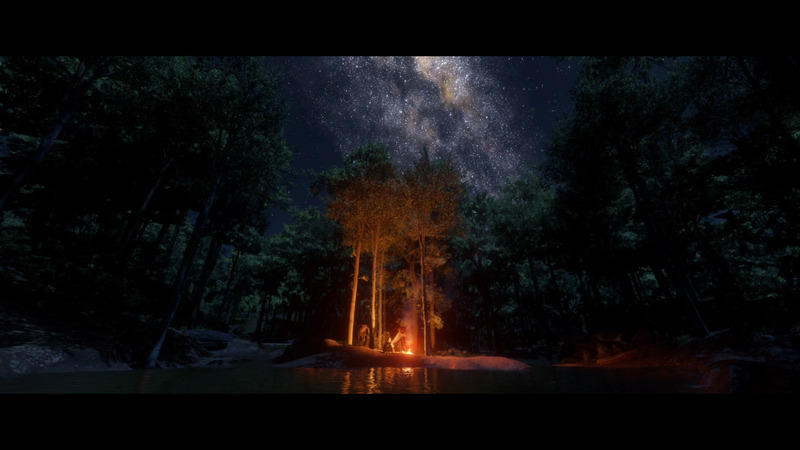 The presence of these stars could simply be another visual milestone which Rockstar wanted to show off, but it could also have an effect on Red Dead Redemption 2’s gameplay. For instance, there might be an ongoing side-quest where the player has to map the stars for an NPC, or there might be a system where the player benefits from specific gameplay bonuses when certain constellations are in the sky (for instance, the Ursa Major constellation might grant a bonus to hunting). Again, it may just be nothing, but the constellation of stars in this shot seems just a little too detailed to simply be background decoration. We suddenly have the urge to drop everything and go hunting with our non-existent horse. Again, this is likely just footage of an NPC and his trusty work horse, but it could also be footage of a player character managing their own farm, much like what the player had to do in the latter half of the original Red Dead Redemption’s story campaign. Perhaps buying and managing your own farm will be one of the opportunities you can pursue in Red Dead Redemption 2’s online multiplayer component, offering players who don’t want to participate in more competitive activities a way to still find meaning in their online sessions. We'd better be able to travel using a canoe. There’s a lot to glean from this seemingly innocuous journey. Canoes weren’t really seen in the original Red Dead Redemption, which means they could serve as a new means of transportation in the sequel, perhaps after the player has made friends with the local tribes. 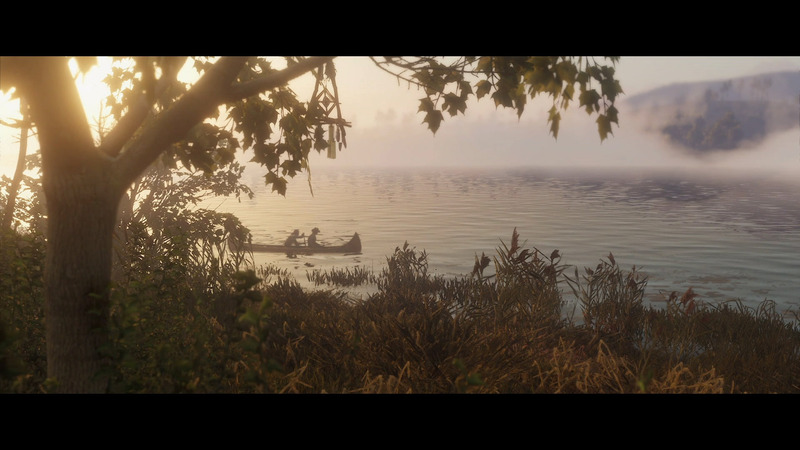 The fact that there’s two people in the canoe could also mean that Red Dead Redemption 2’s story campaign will support co-op, though it’s a little more likely that, if both of the people in the canoe are players, that this is just footage of the sequel’s online component. The trailer really gave us a sense of a living world that we were a part of, but would exist without us. 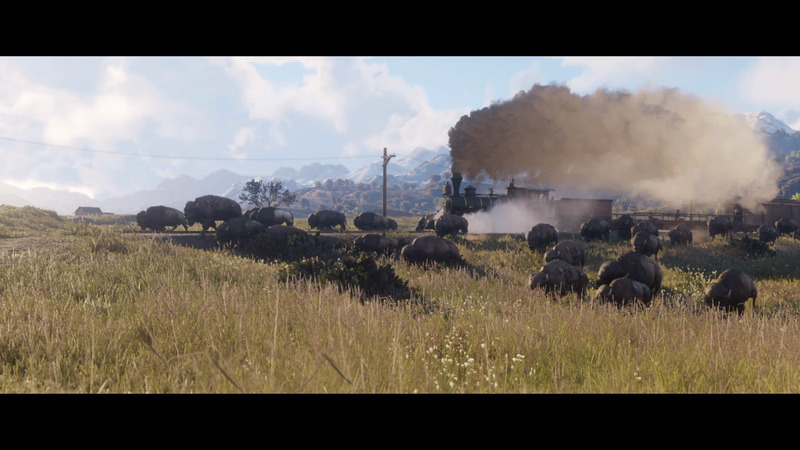 Trains make an encore appearance in Red Dead Redemption 2 as well, and the fact that the roaming buffalo don’t seem bothered by the train (as well as the fact that there are trains period) we see here lends credence to the theory that Red Dead Redemption 2 is indeed a direct sequel to its predecessor and not a prequel. Calling it now. There will be a shootout in and around that store. We'll make sure of it. Those good old general stores from Red Dead Redemption also make a return, and they look a heck of a lot more detailed in Red Dead Redemption 2 than they did in the first game. 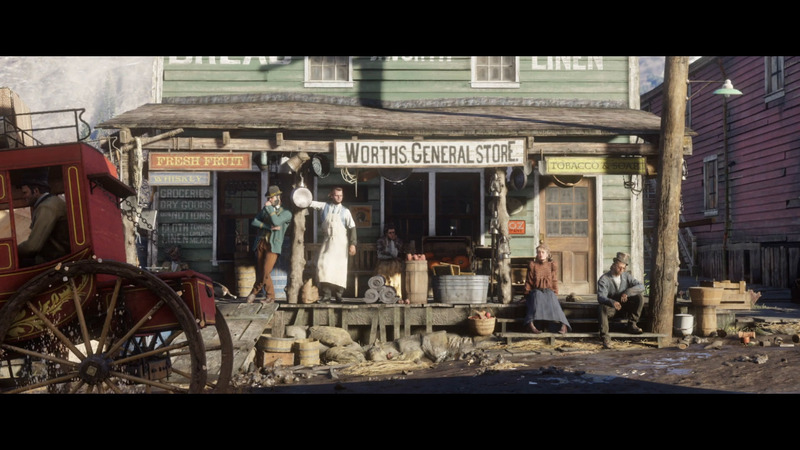 The more upgraded look of this general store could mean that Red Dead Redemption 2 will allow players to influence the growth of local businesses and upgrade them as they see fit. Not many games get horseback riding right, but we've got complete faith in Rockstar. The cow-wrangling portions of the original Red Dead Redemption’s story campaign were just one of those things you either enjoyed or despised. Judging from this footage here, it looks like the activity will make a return in Red Dead Redemption 2, hopefully with an improved AI and better pathing for the cows. Although very beautiful, there seems to be a contrasting grit to this game. In the background, we can see what appears to be the same character from the 0:31 Day in the Life portion of the trailer, lending an equal amount of weight to the theories that he could be an NPC or a player character. 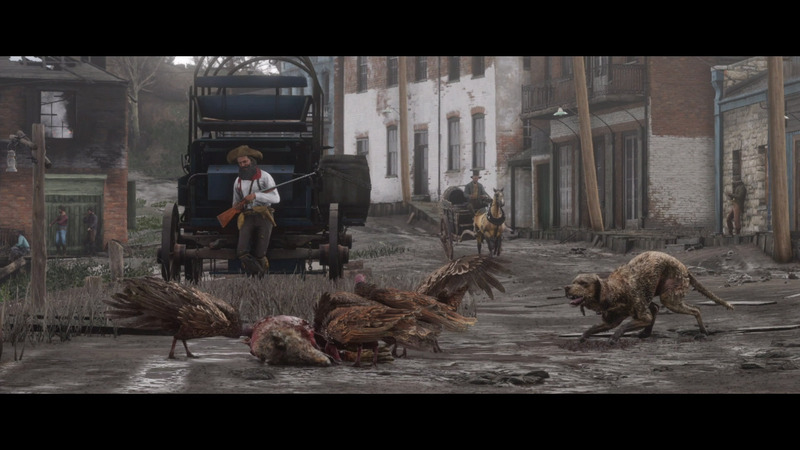 In the forefront, we see more proof that Rockstar has spared no expense when it comes to detail, showing that life in the Wild West can be just as cutthroat for the local wildlife. We have a really bad feeling that our farm just got burned down. The line is clearly being spoken by an older character, most likely to a younger character as a premonition of some impending danger. 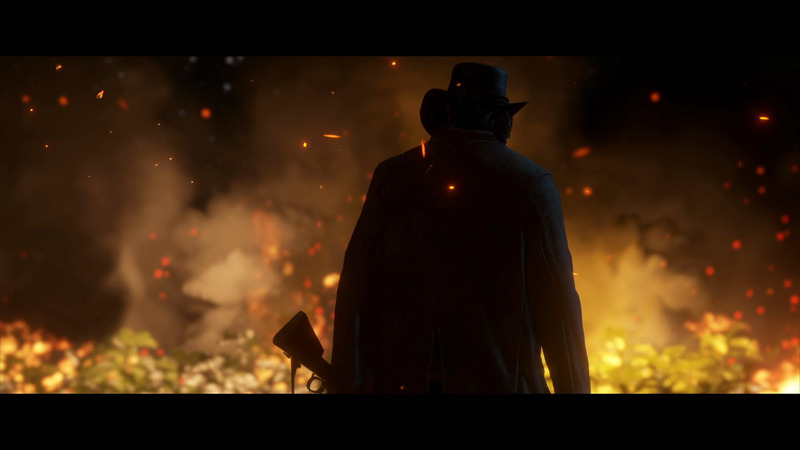 While the voice clip plays, we can see a burning farmstead and an ominous figure holding a rifle as he watches the flames spread. There’s not much we can glean about Red Dead Redemption 2’s story from this brief bit, but it seems to imply that the rifle-holding man is some sort of enemy (or perhaps the player character) surveying the aftermath of what the narrator spoke about. Solid chance that these fools are the ones responsible for the fire. 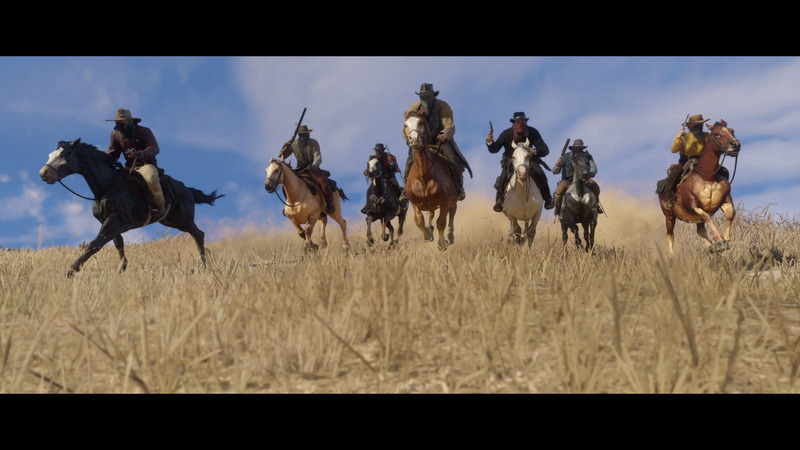 The trailer closes with footage of a gang of riders spurring their horses on to a distant location, guns flourished as they ride. It’s hard to draw concrete facts from so little information given, but this could be a player-formed gang riding off to help those in need, or it could be a marauding band of outriders whom the player must contend with during their journeys throughout the Wild West. 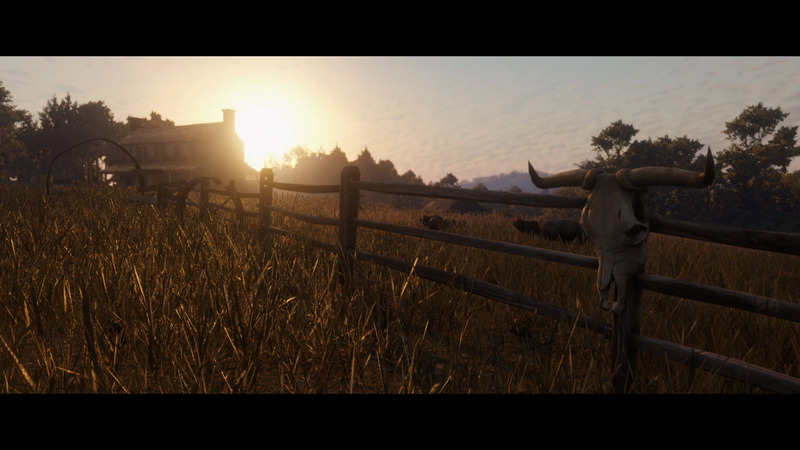 It could also very well be a group of players roaming the countryside in Red Dead Redemption 2’s online multiplayer, proof that said multiplayer will truly allow players to embrace the unforgiving nature of the Wild West (something which many online sandbox games are often compared to). While the trailer doesn’t give fans much to work with, it’s still exciting to ponder and speculate on what the details in the above footage could mean. Hopefully we won’t have to wait too long before Rockstar decides to share additional details, but in the meantime we can at least work with what we have. We’ll have to wait until Fall of next year to play Red Dead Redemption 2 for ourselves, but in the meantime be sure to check out our LevelCamp coverage of the initial Red Dead Redemption 2 reveal, the hilarious Twitter reactions to said reveal , and our top list of memorable moments from the original Red Dead Redemption.